The Resurrection Christmas Program was performed on December 12, 2018. To Download this video, enlarge to full screen. Then go to the upper right corner and click on the arrow pointing down. You will be prompted that says this Google Drive Video cannot download. Ignore that sentence and scroll down and click on Download Anyway. This is a safe video. To Download this video, go to the upper right corner and click on the arrow pointing down. You will be prompted that says this Google Drive Video cannot download. We had First Communion on April 15, 2018. Enjoy the video of our First Communicants at their Mass. Our Mission Statement: Resurrection Parish is a friendly, caring Christian Community composed of members of varied backgrounds who are family oriented and who strive for a oneness of spirit and deeper love of Christ. Our mission is to pass on our Christian values and Catholic traditions by tending to the spiritual, physical and educational needs of all through our worship and stewardship. 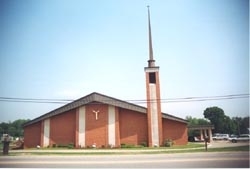 We are located in the Southern Part of Indiana on the West Side of Evansville, in the Diocese of Evansville. 5301 New Harmony Road, Evansville, IN 47720. We welcome you & please enjoy our site. It is updated frequently, so check back. If you use Amazon to order items, use Amazon Smile instead and select The Church of the Resurrection Evansville for your Charitable Donation Recipient.